Monday was the last outing of 2014. 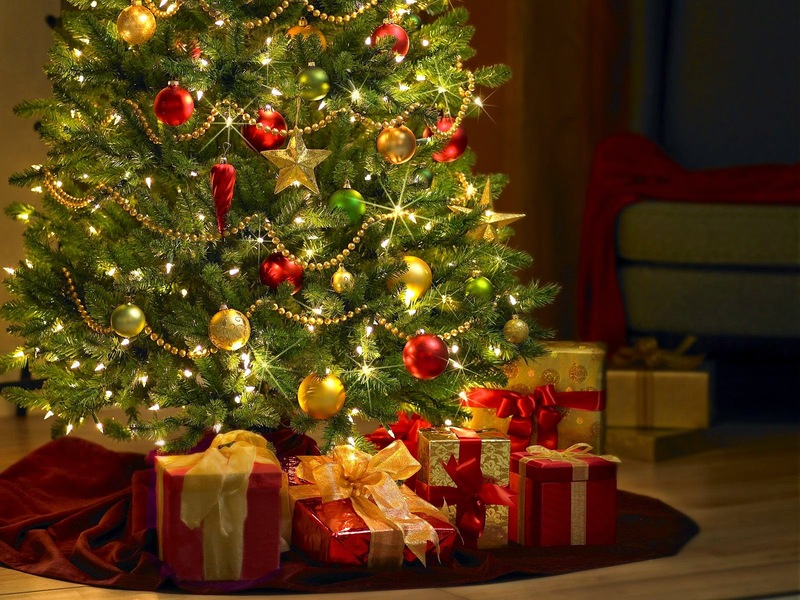 It's hard to believe the year is at end. I joined Kirk and Pete to fish a small stream. Kirk and I have fished it before and this was Pete's first time here. The weather was sunny and cold, not as cold as it's going to get in the next few days..still a great day to toss some flies. Coming to first long pool Pete, who is also known as "TROUT1" who is also known as the master of the bead head soft hackle cast the fly and was soon into a brookie. He stayed pretty much with that fly and was productive. As we moved upstream both Kirk and I were given the opportunity to bring a few jewels to hand. This stream has given up some fine fish. The health of these char is incredible. I have predicted that this stream will give up a 15 inch wild brook trout. One likely spot that may be home to such a brook trout is in the photo below. Several trout of about 12 inches have been spotted here. In the photo Pete is fishing the pool, with Kirk trying to figure out what fly they will take. The pool is quite deep with a dark rock ledge along the center. Pete so named this pool the "Black Hole"
Well I would like to wish all of you a safe and very "Happy New Year"
The Sun, the stream and other things. A late December day. The sun was doing its thing making this angler feel pretty good. I am in the final stages of a cold and those few degrees of of warmth given by a bright sun made the day. All along the stream were signs of winter life. There are some beautiful greens along the brown forest bottom as well as a few animals who found me to be at times amusing, or perhaps a bit of an intrusion. The water was crisp and flowing nicely. Ice has yet to form along the edges so walking was gentle. The fly to start was a Picket Pin. The choice was easy because it usually works, and it was already tied on from the last outing. It did not take long for someone to take interest in the Pin. A splashy swipe, and a good hookup produced a feisty brookie. While fishing a small pool I noticed movement along the bank. Upon further exploration a head appeared above a fallen tree. Several times this brown furry object popped up and down from various fallen debris along the stream, each time it was getting closer. Suddenly it made itself visible. It was a mink. He was beautiful with his hair wet and shinning in the sun. He gave me a close looking over and determined he did not care foe my being in his territory and left. On a day as such a dry fly was going to get called into action. A bomber was chosen and sent on its mission. It was successful. This stream has the prettiest brookies of all the streams I fish. The year is fast ending. I may have the opportunity to fish one more time before we bring in 2015. Brook trout fishing, brook trout fishing in New England in particular may mean tossing a fly into those famed rivers in Maine, or perhaps a back country spring fed pond in Vermont that has been held a secret to a few over the years. There are the large lakes of New Hampshire, and Massachusetts where trolling a fly will bring a bend in the rod. Rhode Island, while not know for their brook trout, as they are for stripped bass, do have a few beautiful brookie streams. 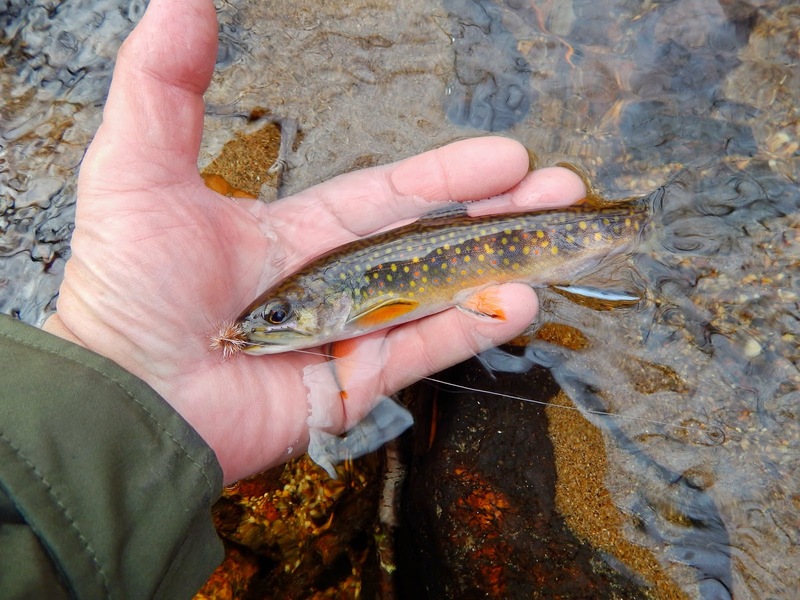 My native state of Connecticut is gifted with many streams that hold and sustain wild brook trout. The Farmington River while not a small stream does have wild population of brook trout. To me this is fine and well accepted. But the "epitome" of wild brook trout fishing is a small freestone stream. These streams have been flowing this way for years. They were dammed at one time or another, perhaps sustained a man made mishap, and natural disasters that are countless. 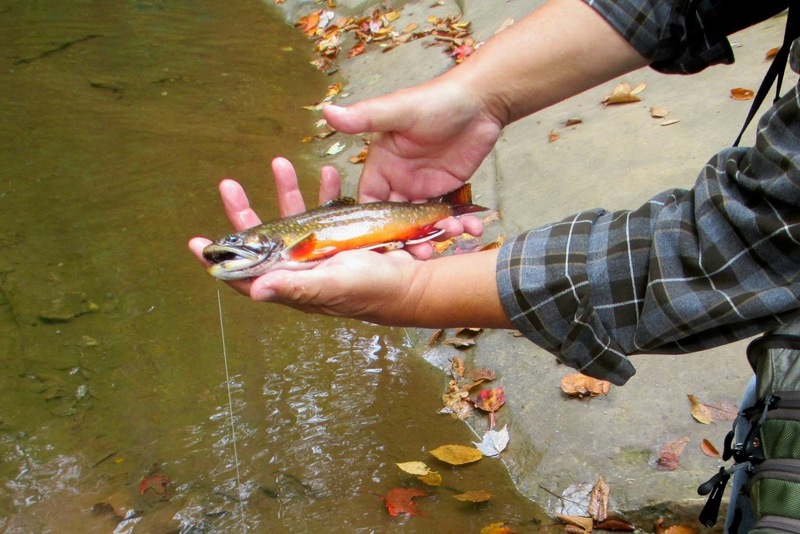 Still they survive as do the brook trout that call them home. It is on these streams that you'll find me. As a matter of fact they will be my choice for almost all of my fishing. I believe this to be because I have never experienced a bad day on them, not meaning in terms of catching brookies, because there are skunks out there, but the whole small stream experience. The "Ausable Bomber". This fly is the creation of Fran Betters. In the back of Frans mind I believe he created it for small streams and wild brookies. These "Bombers" were tied from materials from Frans shop. "Bombers" have taken brook trout in every month of the year. 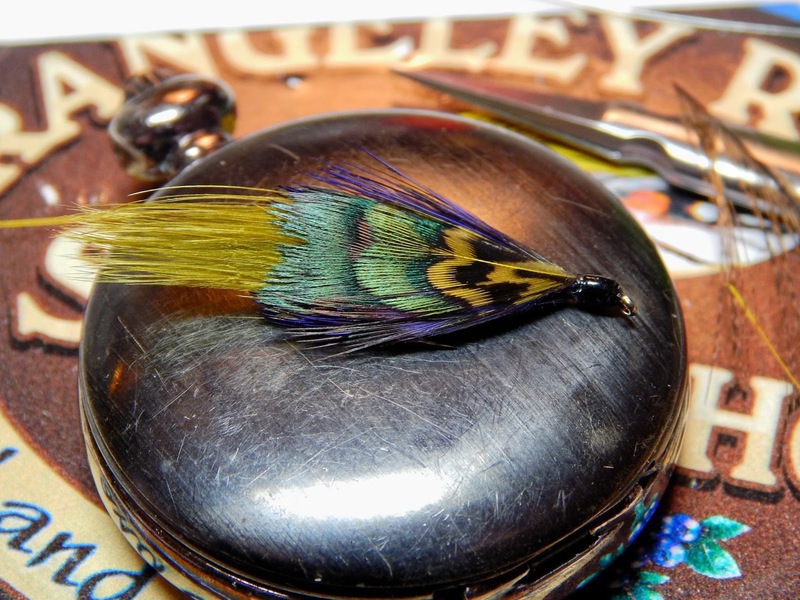 The "Bomber" is the "epitome" of a small stream fly. A small stream that I fished Monday. The fly used was the "Bomber" Letting it work in pool, riffle and run. There were lots of brookies rising to it and even a few to hand. May the light and peace of this time carry you through the New Year. Last Friday night Jeanette and I attended a Kenny Rogers concert. We both are lovers of Kenny's music and have followed him since his days with the First Edition. Kenny did not fail to give a great performance, singing many of his hits as well as lending some of the stories about his life both in song and some of his "sort" of private thoughts. Kenny recently had a knee replacement and was a bit on the sore side, but did his best to entertain. One observation that I made while enjoying the show was the fact of a very distinct odor the permeated the hall. Back in 1967 that probably would have been some tobacco know as marijuana but in 2014 it was the smell of "Ben Gay"........Great show Kenny and Linda. Back awhile, maybe in early Spring Kirk had given me a pocket first aid kit. It was small and compact and contained all the stuff need for a small emergency in the field. The kit was placed in my sling pack and kind of forgotten. When my son and I headed off to Pennsylvania to seek whitetails I placed the kit in my field pack that I carry while hunting. So the time is at hand, deer down and the need for field dressing it. So the first cuts start, no big deal it's been done many times. Well as I was drawing the knife up to the brisket I had the feeling of cold fingers. Well cold fingers, and sharp knives don't mix, and soon I found myself bleeding from my thumb. Wiping the wound I could see it was deep. I reached into my pack and retrieved the first aid kit. I took out the bigger bandaids. Sticking my finger in the snow to help slow the bleeding, I them wiped the finger and put on a bandaid. Well in a minute or two the bandaid could not hold. I put two more on and they did not fare well. In the plastic bag that was with the kit was a roll of black plastic tape. Army training kicked in and I improvised a tight dressing that stopped the bleeding. Not pretty but effective. The other day in the mail I received a package and a card. They were from Mark, "Fishing Small Streams"....The package contained some beautifully tied parachute patterns. They are tied in a range of sizes, and one pattern in particular caught my eye. The fly had a purple body and while I'm not familiar with it I'm sure Mark will fill me in on it. Here is a streamer that was given to me by John, aka Apache Trout. 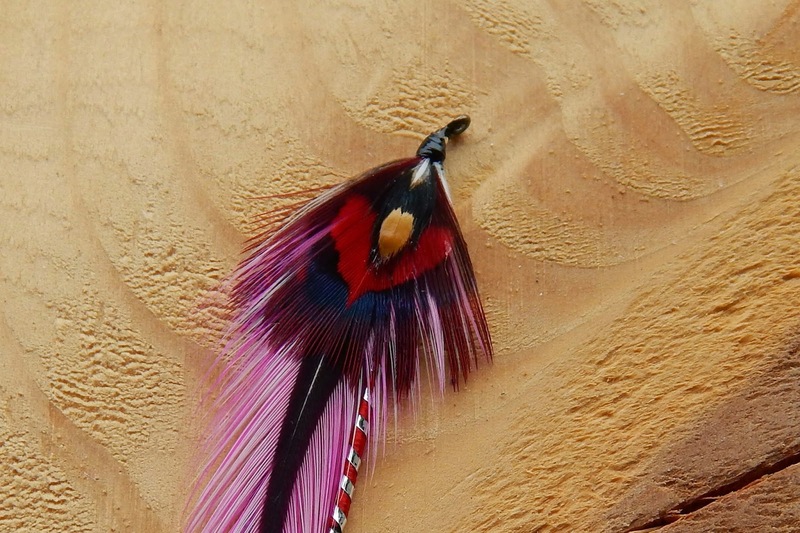 The fly has some Jack Gartside influence, with the pheasant feathers. I don't know the name of the fly, but I'm certain I'll find out. I would like to make mention of this. I would like to congratulate the "DALLAS COWBOYS" on their winning of the eastern division. A stream in brook trout forest. This little stream that flows through some lovely woodlands, and in the past has been good to me. I had not been here since late August and did not know what to expect. The stream had suffered through a dry late summer and into fall. When I saw it in August it was almost dry in places, not a very good scene. Since that time we have received ample rains and the stream has been replenished with the main ingredient needed to sustain wild brook trout. I had no idea on what the low water had actually done to the trout. I was hoping for a good day but I also expected little. The day was cloudy and cold with a sometimes brisk wind. The first fly up was a proven fish producer. After fishing it for a half hour without even a bump the thought was the brook trout had fallen on bad times and there numbers had dwindled. I moved upstream to a run/pool that has provided a fish or two on dry flies. I tied on a bomber, what the hell if your not catching trout on flies you might as well not catch them on dry flies. I sent the bomber on a drift and quickly a rise and a miss. Several more attempts and in seemed they liked the bomber. Finally I was able to hook up. In a few moments I held a wonder. The brook trout was in almost perfect condition. The fish had survived a very bad period of low water as well as the spawn and came through in good shape. I tied on a small yellow muddler and worked it the pool. Several casts later a brookie struck and soon was at hand. With a short time left to the fishing day I decided to fish a few deep pools on my way back to the car. I tossed the muddler out and as soon as it stopped its drift a crazy brookie almost launched itself onto the bank to grab the fly. I said to myself no way is this fish coming back. On the second cast it did just that, this time he got stuck. What the heck is a "muddler" Seems that this stream has a few survivors. Here's hope that this stream in brook trout forest is back. 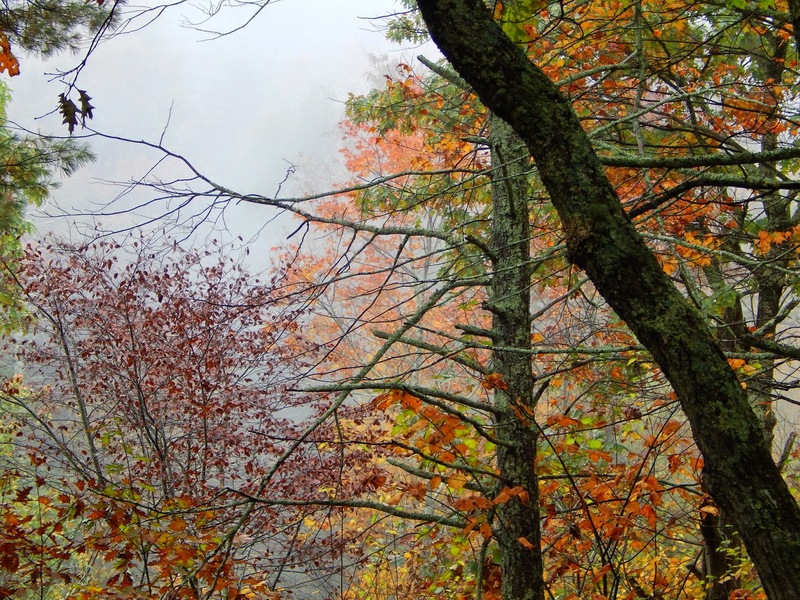 These Are some photographs of our trip to Shenandoah National Park. The trip was in the first week of October. The park is incredible, one could find beauty everywhere. I hope to return there. Winter well Shenandoah. Sunday morning dawned with a bright sunny sky, and a promise of slightly warmer temps as the day progressed. Warmer is relative in the middle of December here in New England, but a few degrees in air temp can translate to a few degrees in water temps and those few degrees can make for fishing success in terms of activity to the fly. I teamed up with Kirk and the plan was to visit a small stream in northern Connecticut. We had not fished here since first fishing it in late August. At that time the stream was low and while giving up a few fish it did not show us what it could be like in better times. Don't get me wrong I'm not saying that December is prime time for fishing, but what I mean is the water conditions as far as flow is concerned were almost perfect. As you can see the water was very clear. The trout were aware of us long before a cast was made. While peering down into the stream you could see the bottom and everything that moved along it. What seemed devoid of fish the stream came alive as the "pinkie" drifted along. 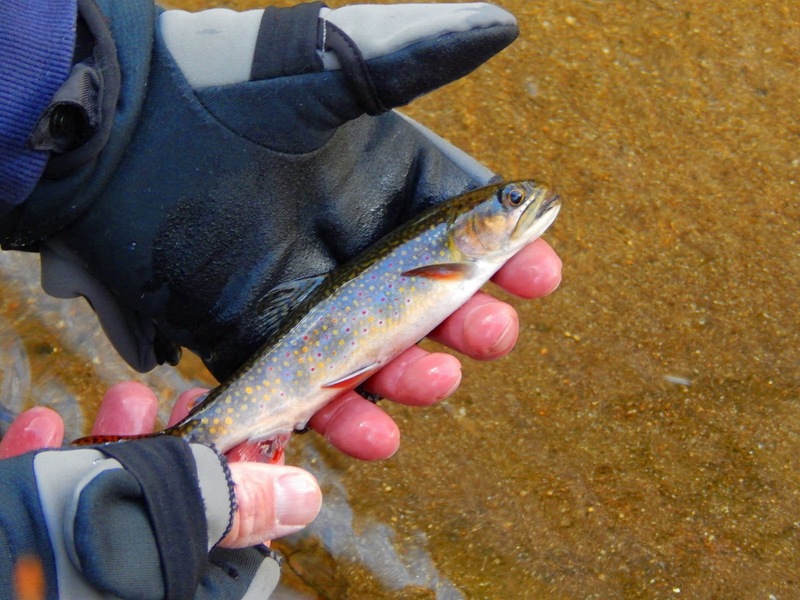 Suddenly there were little brook trout who were holding on the bottom darted for the fly. Watching this is almost as rewarding as hooking one of those wild char. Drifting the "pinkie" in places as this I finally managed to hook a brookie. I had experienced several hookups before but this was my first to hand. A Connecticut wild jewel. This guy was so spunky for a fish it's size. 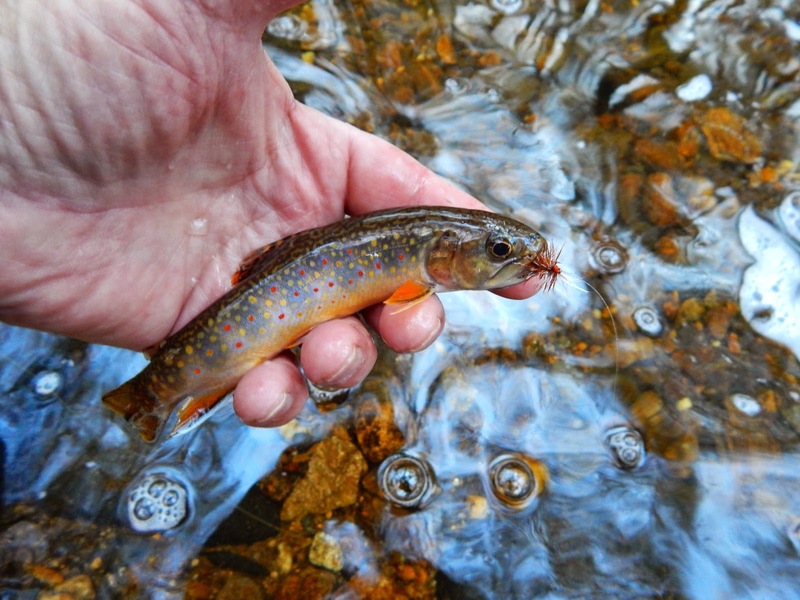 After releasing the brookie I continued to fish the "pinkie". The fly continued to attract attention and what I noticed was that the interest in it was at midway between bottom and surface. I reached into the fly box and selected a Smoky Mountain Fork Tail. Yes sir some dry fly action was in the back of my mind. I worked a beautiful stretch of water and the Fork Tail did the rest. Many looks, a few takes, and finally one that got caught. Fishing a small stream always excites me, and instills in me that special rewarding feeling that's hard to put into words. I can only say this the smile on my face when I held this brookie, a trout that took a dry fly in a clear December stream, would have been smile for the ages. Kirk and I fished this stream this day, both catching fish. We enjoyed cups of hot coffee and tea along with some prime venison jerky. We ended the day stopping to check on a few other streams and headed home. When I started this blog I reached out to a community of anglers who enjoy the beauty of small stream angling. Over the years I have been introduced to so many followers of "Small Stream Reflections" in person, by comments made on the blog, and so many emails. The most common theme to all of the communication is inspiration. Not only do I inspire others, but you inspire me with these comments. A few weeks ago I received an email from Seth, an angler/fly tyer from New Jersey. He commented on a post I did on tying parachute flies. In the post I said how effective these flies are and how it's almost impossible for me to tie them. He told me it would be a pleasure for him to tie me a few of these parachutes to try. He asked for my name and shipping address and said he would send them out. A few days later I received this Altoids tin full of Adams parachute flies. They are tied beautifully, something he should be proud of. When I contacted Seth to thank him, as well as his permission to use his name in a blog post his response was yes. He then mentioned how nice it would be to see one of his flies stuck in the corner of a brookies mouth. Well Seth I'll be fishing this weekend and I"ll see if I can arrange such a request. Below is the recipe that Seth gave for tying these flies. "Thanks buddy"
Hook, Dai Riki 320...Thread, Uni 8/0 Black...Post, Poly Yarn...Tail, Barbs From Collins Cree Neck...Hackle, Collins Cree Neck...Abdomen, Stripped Metz Dun Hackle Stem...Thorax, Orvis Spectra Blend Adams Gray. This is another fly I received in the mail last week. It's a bit of a mystery. The fly had no name, either the pattern or the tyer. The envelope had a Connecticut postmark but that's it. It's a good looking wet fly, perhaps a dark cahill variant. It has a body with a silver tinsel rib, an underwing of what appears to be antron, and a Mallard overwing. If this tyer reads this, would you please contact me as to the pattern name as well as yours. The community of fly tyers who love strapping feathers and silk as well as tinsel to long hooks are about to be gifted with a book by a fly tyer, and historian on the subject of "featherwing streamers". Sharon E. Wright from Maine will release the book "tying Heritage Featherwing Streamers" in January 2015. Sharon is in good company, for Maine is known for women streamer tyers, Carrie Stevens, Selene Dumaine, and now Sharon Wright. The Winter issue of Fly Tyer magazine has a feature on the book as well as Sharon. I am looking forward to purchasing my copy of her book, and will do so at the "Fly Fishing Show" being held in Marlboro, Massachusetts in early January. Below is a featherwing streamer I created and will be passed down to my children and grandchildren.